Repeated steps except using 4.7.1 compiler; and, I did NOT see the problem. The problem did NOT show back up. Edit2: I realized I built the bad version using CB svn 9156; trying again using that CB version to see if problem happens again. Edit3: Found no problem using CB svn 9156 to build; no idea why the first time had a problem. 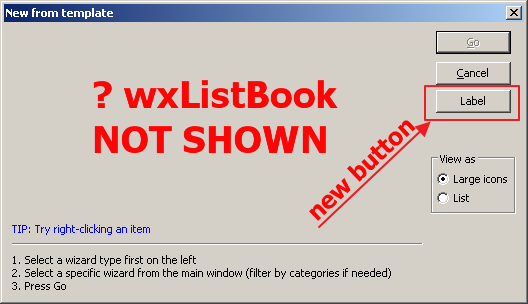 You see, I have comment out all the operations on the dialog, but the wxListBook control still not shown correctly. It looks like the option: Resize border should be enabled compared with other xrc, but when I enabled this, I still have this issue. 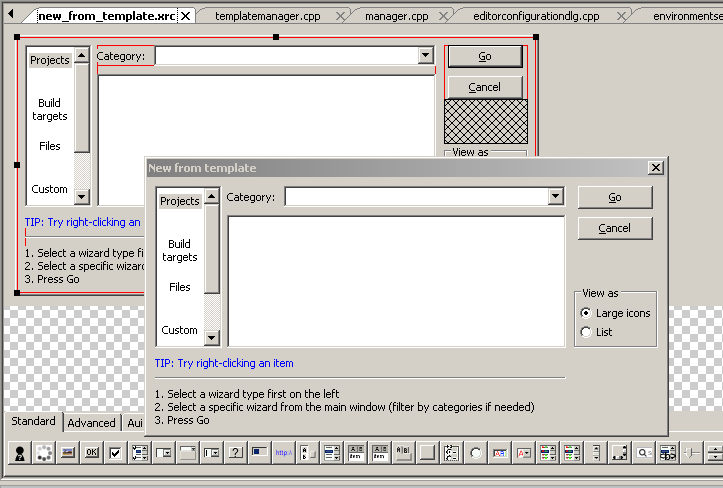 I will try to get a deeper look into it, but I need to install C::B, C::B sources, wxWidgets and MinGW to test. This will probably need some time. I think it is better we can have a Codeblocks_debugwx.cbp file which link to the debug version of wx library, so that catch bugs in wx is quite easy. It looks like wxLC_LIST is broken on WinXP, so my changes in svn r9390 to SetSettingsIconStyle break the NewFromTemplateDllg on Windows XP (not win7 !). Using wxLC_SMALL_ICON instead of wxLC_LIST work non XP. If it does work on win7 (wx2.8 and wx2.9+) I commit this fix, otherwise, I will find another solution. Could you please check, whether the issue is fixed in svn r9405 ? Thanks. It works fine now! Great work. 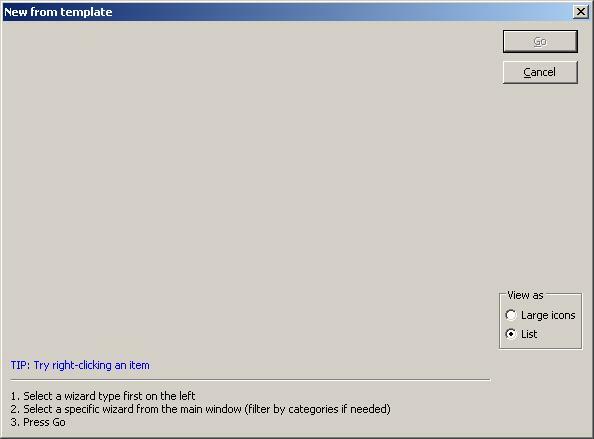 If I try the project wizard, there are no targets as mentioned in this thread. Another issue that I noticed, was that the compilation was unusually slow. I didn't time it or watch it, but it seemed to take forever. For my own projects, I also use wx 2.8.12, but compile and link it statically. As I compiled wx, I noticed there was a huge number of warnings being issued about "unused local typedefs" in wx/defs.h and perhaps other places. Writing all these warnings took a loooong time. This appears to be a side effect of gcc 4.8.1, but so far I have not found any way to switch those warnings off. Suggestions welcome. add the compiler option -Wno-unused-local-typedefs to reduce warnings. Or manually remove this dummy typedef in the wx source. export CXXFLAGS="-Wno-unused-local-typedefs" in the console. The other issue is fixed later and there are more fixes to the settings-dialogs I am working on. I will commit them most likely this afternoon/evening/night, but it's always much to test (WinXP, Win7, Liinux and wx2.8 and wxtrunk). Thanks a lot, but I believe that option (-Wno-unused-local-typedefs) is removed in gcc 4.8.1. I tried, and it doesn't work. I believe the opposite (-Wunused-local-typedef) is now implicit in -Wall, without any way of turning it off. A last resort solution is to start fiddling with wx 2.8.12 source, but it isn't ideal. I shall watch your C::B folder and try again when I see the update. Your work is much appreciated! I use it here and it works with gcc4.8 on Fedora. Ok, i will double check. Thanks again. I have double checked now, and you are correct again Somehow, I messed up the first time. As I have many code::blocks projects with several targets in each, it isn't straghtforward to update them all. As a temporary solution I have therefore enabled the two options above as global C::B compiler settings for gcc. A better solution would be to use some tool to add them to my project files, I guess.